Categories: memories	Tags: childhood, gyroscope, memories, toy. Running out of ideas for videos already and it’s only day 5 of Vlomo08. 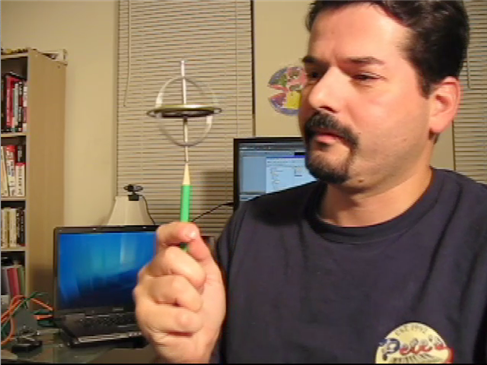 So I looked at my desk and saw a gyroscope toy I purchased recently from the Exploratorium store in San Francisco. As a 9-10 year old kid living in Toronto, I loved going downtown to the Eatons and Simpsons stores. They always had the best toy displays and the coolest stuff. At Simpsons I was mesmerized by a demonstration of this cool gyroscope toy that could do, what appeared to me, some amazing tricks that defied the laws of physics. I wanted that toy so bad that year. I never got it. I ran into it 30 years later and now, $6.50 later, it’s sitting on my desk. After palying with it however, I realized that it not so cool after all.